I think I have just enough applications to round out the month, before calling it quits. Of course, as luck would have it, somehow I made it through 30 months of text-based applications without mentioning tree. So there will undoubtedly be something leftover at the end. Mentioning ddir first was probably wise though, since tree does most (if not all) of what ddir can do, and then some. I never did find an option in ddir for line-drawing characters, but tree does that by default, has options for color, can use ANSI lines and even codepage 437 graphics (which may or may not produce decent lines on your machine, without the help of cp437). 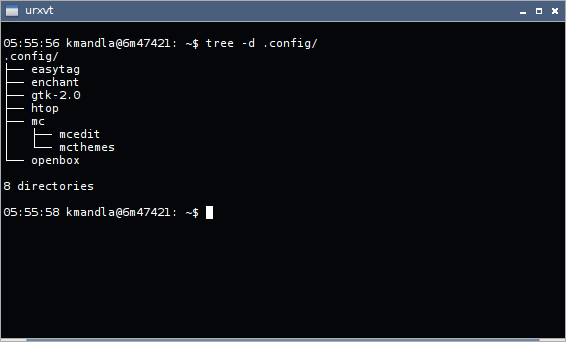 And perhaps of interest to higher programming powers than I, tree also has options to export to XML and JSON. It’s not terrifically beautiful, but I can see where that would be a great option to have available. But that’s about all there is to say about tree. It does much the same as yesterday’s program, just with a little more panache. In Debian, in Arch, in … just about everything, I think. This entry was posted in Linux and tagged directory, folder, structure, tree on 2015/04/13 by K.Mandla.